Rev. Timothy McDonald (second from left) and Student Minister Sharrieff Muhammad (second from right) prepare for ribbon cutting at Blue Seas Express & Catering in Atlanta, a joint economic partnership between Muslims and Christians. Blue Seas Express & Catering is located in Atlanta. 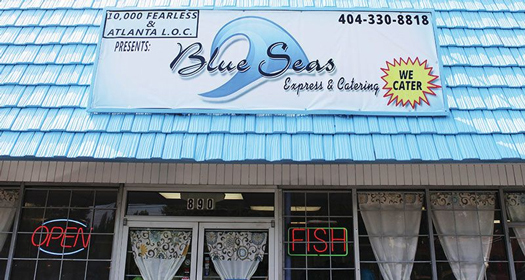 ATLANTA—The Atlanta Local Organizing Committee (LOC) and 10,000 Fearless Men and Women Headquarters of the South established a combined economic development venture in Atlanta called Blue Seas Express & Catering. The casual environment, “soul-fully healthy” Southern cuisine served at the eatery is quickly becoming a local favorite. 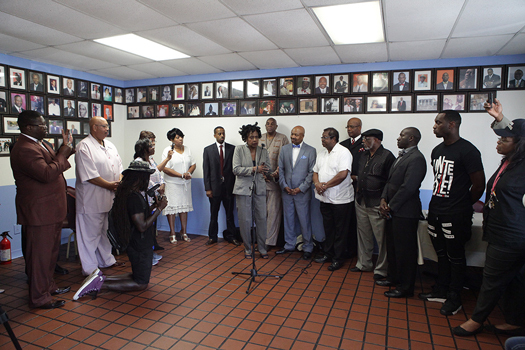 This new eatery hosted its grand opening on Aug. 4 by way of a coalition of organizations and supporters led by Student Southern Region Minister Abdul Sharrieff Muhammad of the Nation of Islam and interim National Director of the 10,000 Fearless Movement and Reverend Timothy McDonald of First Iconium Baptist Church in Atlanta. When you walk in the restaurant, all guests are extended a “Welcome to Blue Seas!” greeting, bound to put a smile on any face. The menu is complete with classics such as mouth-watering Southern fried chicken, fried fish, grilled Salmon, navy bean soup, Philly Fish Subs and the Supreme Bean Pie. One of the crowd favorites is quickly becoming the One Dollar ($1) Steam Table, that includes steamed vegetables, mac-n-cheese and your choice of meat. This venture ties right into one of the initiatives that followed Justice Or Else, the 20th Anniversary gathering of the Million Man March held last year which was “Buy Black”. The command was to boycott Christmas, support our own businesses and develop businesses by pooling resources. The Honorable Minister Louis Farrakhan said at the March, “Our unity is more powerful than a nuclear bomb.” Many returned home after the gathering in Washington, D.C. in 2015 with the zeal to support their own, meaning Black Businesses. The key to the success in the Black community is economic withdrawal, taking our dollars for example, and putting them in Black-owned banks. After the March the 10,000 Fearless Men & Women of the South formed as an extension of the Atlanta L.O.C., with the mission to “Make our Community a Safe and Decent Place to Live,” an instruction given by Minister Farrakhan. In order to bring that into reality, we would have to find ways to create jobs, programs and patrol our own community to bring love and unity deeper into the Black community. The eatery serves a variety of delicious, mouth-watering cuisine. This economic strategy will come from the leaders in the community. We have to stop begging people to do for us what we can do for our self. Student Minister Sharrieff Muhammad and Rev. McDonald are making history and they plan to help every city around the country duplicate the same strategy. 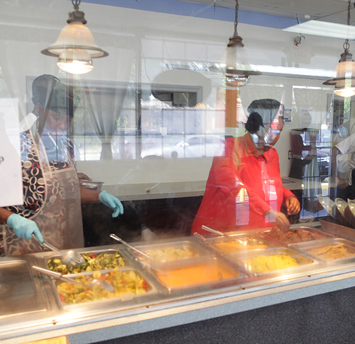 One of the guests that joined and ate at the grand opening was Faye Coffield, county commissioner of Dekalb County. “That was some of the best fish I have ever tasted and vegetables were beyond belief, it was all good and I will definitely be back,” said the commissioner. This was the sentiment of all of the customers that came in that day and the restaurant has been very busy since then. 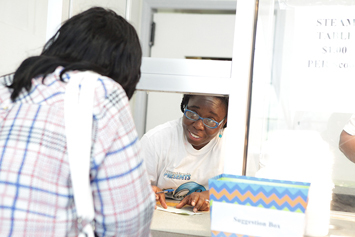 Community leaders and local residents gathered for a grand opening and dedication of Blue Seas Express & Catering. The grand opening ceremony was attended by many community leaders such as Bishop Greg Fann, Rev. Gerard Durley, Pastor Derrick Rice, Rev. Albert Love, LaMarcus Cook, Betty Maddox, Tammy Parrish, Student Minister Darryl Muhammad, Student Minister Tremon Muhammad, Student Minister Shaun Muhammad, Bro.Terry Muhammad, Student Minister Arzo Muhammad, Bro. Student Captain Craig Muhammad, Bro. Christopher Muhammad and Bro. Khallid Muhammad. For more information, visit Blue Seas Express & Catering at 890 Joseph E. Boone Blvd Atlanta, Georgia, 30314, call at 404-330-8818 or visit online www.blueseasexpress.com.